Bring a large pot of water to a boil and salt it. 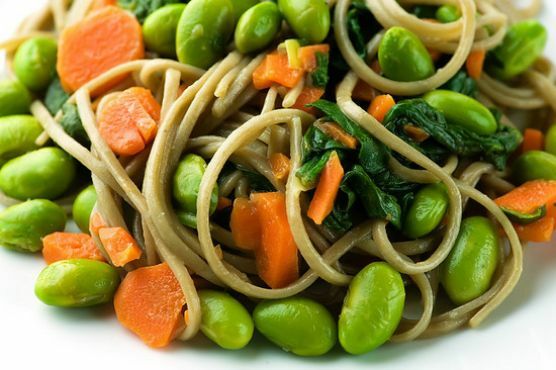 Drop in the noodles and carrot and cook until tender, 2 to 4 minutes; add the edamame and spinach for about 15 to 30 seconds just to warm, then drain everything in a colander. Set aside. In a large salad bowl, whisk together the soy sauce, lime juice, miso and mirin or sugar. Add spinach, noodles, carrot, edamame, scallion, and toss; then taste and season with salt and pepper as needed. Garnish with grated ginger at the table.